SafeZones Ally: Submit your training request here! 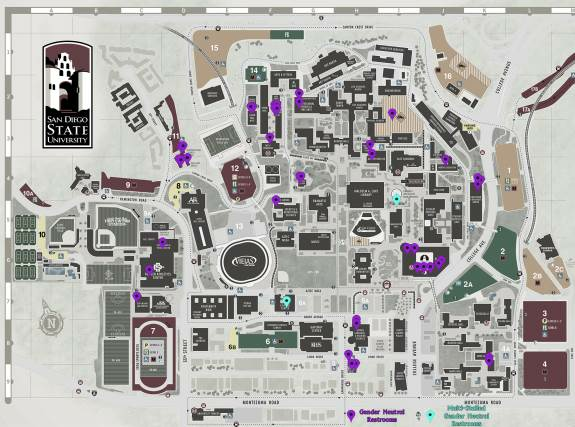 For a copy of the Gender Nuetral Restrooms list and map, come by The Pride Center! The Chief Diversity Officer (CDO) serves as the university’s executive level diversity and inclusion strategist. Working with the president and senior university leaders, the CDO collaborates with departments across the institution to achieve the diversity mission of the university. SafeZones@SDSU works to ensure a campus atmosphere that is welcoming, informative, educational, and safe for all lesbian, gay, bisexual, transgender, queer, questioning, intersex, and ally (LGBTQQIA) students, faculty, staff, administrators and members of the campus community. Lavender Graduation is open to all students graduating Spring Semester who identify as lesbian, gay, bisexual, transgender, queer or are allies. Students receive a certificate and rainbow cord to wear with your academic regalia during commencement and an invitation to join the LGBT Alumni Chapter. LGBT Aztec Alumni's mission is to promote & support the relationships between SDSU's LGBT Alumni, current students, administration and the community who support them. Utilizing events throughout the year, LGBT Aztec Alumni connect these groups for social and professional networking. The President's Advisory Committee on Equality (PACE) serves as the body of dedicated, diverse, campus and community leaders, who are recognized by the Office of the President in an advisory capacity. The group focuses on advising and supporting the Office of the President through the Director of Diversity in several important areas.